This image shows an artist's rendering of the inner regions of a quasar powered by a supermassive black hole at the center. As the disk of gas and dust falls into the black hole, the high temperatures create light. Differences in this light can help astronomers measure the black hole's mass. Monster black holes hide in the centers of most galaxies in the universe, and now, a new technique is helping scientists measure the mass of some of the very largest black holes in the universe, even when they lie at the centers of very faint, distant galaxies. The new approach could dramatically improve scientists' understanding of how these behemoths form and evolve, and how they influence galaxy evolution. "This is the first time that we have directly measured masses for so many supermassive black holes so far away," Catherine Grier, a postdoctoral fellow at Penn State, said in a statement from the Sloan Digital Sky Survey (SDSS). Grier led a project to measure the masses of a wealth of so-called supermassive black holes using SDSS data. She reported the results Tuesday (Jan. 9) at the American Astronomical Society meeting in National Harbor, Maryland. Based on decades of galactic observations, astronomers now theorize that the heart of nearly every large galaxy contains a supermassive black hole (SMBH). These monstrous beasts can be millions or billions of times more massive than Earth's sun. Black holes don't radiate or reflect light, so these SMBHs can't be seen directly. But as the gravity of an SMBH draws in dust and gas from the surrounding galaxy, it creates a swirling disk of material that falls into the black hole. That infalling material heats up and begins to radiate light, making the black hole "visible" (albeit indirectly). In some cases, the light from these disks becomes brighter than all of the stars in the galaxy; these incredibly bright galaxies are then called active galactic nuclei (AGN). The brightest AGN are called quasars, which astronomers can see all the way across the visible universe; they indicate the presence of a supermassive black hole, according to the statement. Black holes have only three measurable properties — mass, spin and charge — so calculating the mass is a huge part of understanding an individual black hole. In nearby galaxies, astronomers can observe how groups of stars and gas move around the galactic center and use those movements to deduce the mass of the central black hole. But distant galaxies lie so far away that telescopes can't resolve the stars and clouds of material around the black hole, according to the statement. A technique known as reverberation mapping has made it possible for astronomers to measure the masses of these outlying black holes. First, researchers compare the brightness of the radiating gas in the outer region of the galaxy with the brightness of the gas found in the inner region of the galaxy. (This inner region, very close to the black hole, is known as the continuum region). The gas in the continuum region affects the fast-moving gas farther out. However, light takes time to travel outward, or reverberate, causing a delay between the changes seen in the inner region and their effect on the outer region. Measuring the delay reveals how far away the outer disk of gas is from the black hole. Coupled with its rotation rate around the galaxy, this allows astronomers to measure the SMBH's mass, Grier told Space.com in an email. But the process is painfully slow. To observe the reverberation effect, an individual galaxy must be studied over and over again for several months, while distant quasars can take several years of repeated observations, researchers said in the statement. Over the past 20 years, astronomers have managed to use the reverberation technique for only about 60 SMBHs in nearby galaxies and a handful of distant quasars. As a part of the SDSS Reverberation Mapping Project, Grier and her colleagues have begun mapping SMBHs faster than previously possible. The key to this faster mapping comes from the project's dedicated wide-view telescope, located at the Apache Point Observatory in Sunspot, New Mexico, which can collect data on multiple quasars at the same time, according to Grier. It is currently observing a patch of the sky that contains about 850 quasars. The researchers observed the quasars with the Canada-France-Hawaii-Telescope in Hawaii and the Steward Observatory Bok Telescope in Arizona to calibrate their measurements of the incredibly faint objects. 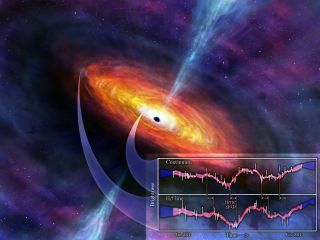 In total, the researchers have now measured reverberation time delays for 44 quasars, and they used those measurements to calculate black hole masses ranging from 5 million to 1.7 billion times the mass of Earth's sun, according to the statement. "This is a big step forward for quasar science," Aaron Barth, a professor of astronomy at the University of California, Irvine, who was not involved in the team's research, said in the statement. "They have shown for the first time that these difficult measurements can be done in mass-production mode." The new measurements increase the total number of galactic SMBH mass measurements by about two-thirds. Because many of those galaxies are very far away, the new measurements reveal SMBH masses from further back in time, to when the universe was only half its current age. By continuing to observe the 850 quasars with the SDSS telescope over multiple years, the team will accumulate years of data that will allow them to measure the masses of even fainter quasars, whose longer time delays cannot be measured with a single year of data. "Getting observations of quasars over multiple years is crucial to obtain good measurements," said Yue Shen, an assistant professor at the University of Illinois and principal investigator of the SDSS Reverberation Mapping Project. "As we continue our project to monitor more and more quasars for years to come, we will be able to better understand how supermassive black holes grow and evolve." After the current fourth phase of the SDSS ends in 2020, the fifth phase, SDSS-V, will begin. SDSS-V features a new program called the Black Hole Mapper, in which researchers plan to measure the SMBH masses in more than 1,000 quasars, observing fainter and older quasars than any reverberation mapping project has ever managed. "The Black Hole Mapper will let us move into the age of supermassive black hole reverberation mapping on a true industrial scale," Niel Brandt, a professor of astronomy and astrophysics at Penn State and a longtime member of the SDSS, said in the statement. "We will learn more about these mysterious objects than ever before."